These are steered by making the left wheels turn at a different rate to the right. Necessarily the tyres must slide sideways on the ground whenever this occurs. There is significant disturbance to vegetation. When turning, all axle lines intersect at the same point (the turning point). In principle, there is no sideways skidding of the wheels, and only minimal disturbance to earth or vegetation. These spread the load of the rover over the whole of the tracked bottom, so when driven straight, cause minimal disruption. However when they turn, they will churn up earth or vegetation. Wheels can turn any direction and move independently. Like Ackerman steering, all axle lines intersect at the turning point, but the intersection point can be anywhere - even within the robot boundary. 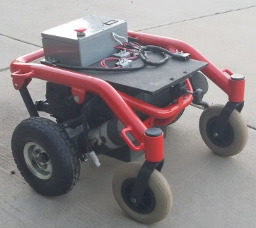 Hence the robot can turn on the spot with maximum versatility and minimum ground disruption. The drive wheels are driven differently, and the turning point is anywhere on the main axle line. Casters on the front or back just swivel to follow the movement and take the load. The tyres might rotate on the spot, but don't actually skid sideways. Disruption to the earth or vegetation is low. A cool in-factory innovation, with high manoeuvrability, but these will clog instantly on mud, and are hence useless for agricultural robotics. snow vehicles - which require traction on a soft surface. None of these applications require any consideration of protection of vegetation. ride-on lawnmowers - (the larger ones are generally differential drive) which are highly manoeuvrable and also driven on quality lawns with minimal damage. 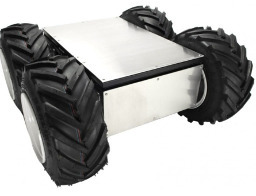 This should give us a clue as to what drive forms are suitable for agricultural robots. Robots are about new technology but they do not change laws of physics, and generations of smart people have solved many agricultural problems already. Tracked vehicles are good at getting into inaccessible places, but the majority of farm land is not inaccessible (goat farms notwithstanding). Tracked vehicles work well on steep slopes, but golf-cars and zero-turn lawnmowers also have a very low centre of gravity. In short, farmers care about the protection of their vegetation. Chewing up crops damages the crops, and results in a lower yield. A pasture that gets chewed up is a pasture which will be covered with weeds next year, which will mean lower productivity, more work and possibly having to use use more poison. 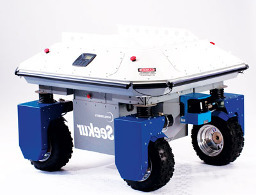 A tracked robot is likely to create more work than it saves. Further, tracked vehicles are inefficient - they need more energy to drive them. A fossil fuelled vehicle will be more expensive to run (and pollute more), and a battery powered vehicle will not last as long between recharges. 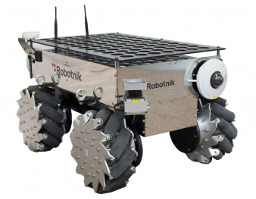 A swerve drive robot may seem like a good alternative, but these will require eight motors, and there is no way that the complex drive mechanisms can complete with a simple differential drive in cost, reliability, or robustness. They will simply be too expensive to build, and too easy to break - particularly in a testing phase where they will run into things and fall into negative obstacles (ie holes). The shape of golf cars and zero-turn (ie differential drive) ride-mowers should also give some clues about how to build agrobots. Firstly, they have very wide tyres with very little tread - that is, they spread the load as far as possible without using tracks. This is how they minimise vegetation damage. There are disadvantages of wide smooth tyres too - the wide smooth tyres mean that slippage will be a serious consideration - particularly on slopes, making wheel encoder / dead-reckoning navigation almost useless. Navigation algorithms have to take this into account. In summary, agricultural roboticists can learn from the lessons of others. High manoeuvrability situations call for differential drive, low manoeuvrability situations call for Ackerman drive. If operating on grass, both call for wide, low tread tyres. High-traction (ie high disturbance) tyres should be reserved for pulling a plough. IBEX tracked agricultural robot - chewing up the English moors one skid-mark at a time. SwarmFarm - an interesting exception which uses a reverse pendulum swerve drive on a single wheel. 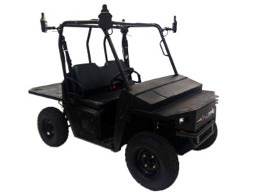 QUT spray vehicle - converted agricultural runabout. Weedinator - a semi-swerve drive by Goat Industries. This is a cool machine, but the use of stepper motors lowers efficiency, and the battery life will be much reduced, requiring an on-board dinosaur powered generator.